Ok it’s been a LONG time since I’ve posted a recipe…It’s been a busy few months and these have been stacking up. In particular, this one is long overdue. 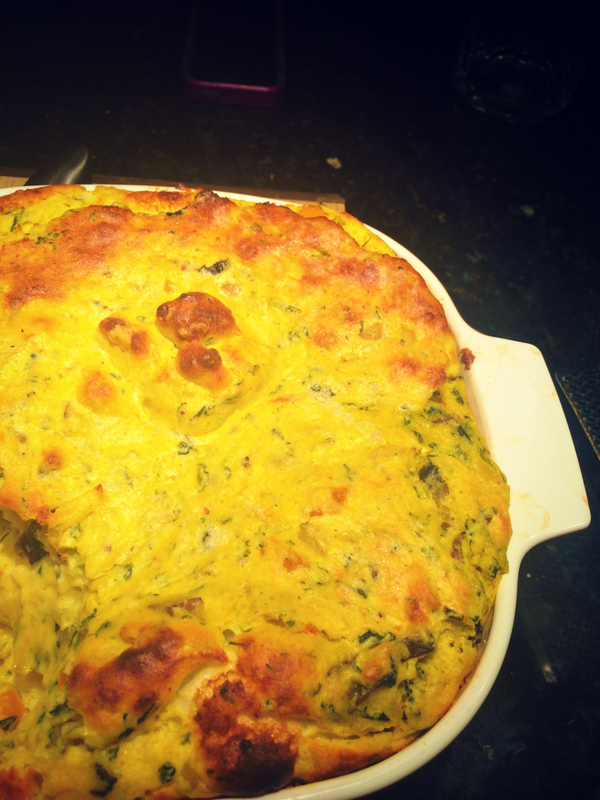 It’s got a fair amount of cheese and eggs in it, so I wouldn’t call this an “everyday” dish. But on occasion it’s ok. The base recipe: I modified this recipe, which is easier than most souffle recipes in that it uses xantham gum as a secret ingredient to keep the whites stiff longer. I modified it because it simply didn’t seem to have enough flavor. And I generally don’t have whole milk laying around. I also found you can use less butter. ramekins, a souffle dish, or just a tall-ish pyrex baking dish. I use a deep casserole pan. so it doesn’t present as pretty, but it does the trick and it still tastes really good. Prepare your dish: Butter all sides of your dish–look at it carefully–you want to see the butter. it helps the souffle to rise. Sprinkle in the parmesan cheese and shake it around. you will see where you haven’t buttered because the cheese won’t stick. Shake out the excess. re-butter parts that need it. add in the egg yolks only. Mix well, and stir until everything is well incorporated. Set aside for now. You want it to cool. If you’re doing it by hand, whip fast. the balloon whisk does wonders compared to a regular one. If you’re doing it by electric beater or stand mixer, start on low and quickly move up to the highest setting. whip to medium-stiff peaks (you want them to form a peak that stands up when you lift the whisk out). Add your xantham gum and whisk a second or two longer. In your prepared pan, pour in the bechamel. Slowly add in a little of the egg white mixture and fold in. carefully fold in the rest. Don’t beat in or stir too fast or your whites will lose the air you just put into them. bake: Bake at 400 for about 18-20 mins. the souffle will rise, the top will be a bit golden, and the center will be set (don’t test it with a knife). Don’t open your oven in the middle…just wait for it. pull out and serve immediately. I serve this with a salad. or last night with marinated mushrooms, asparagus, and artichoke. 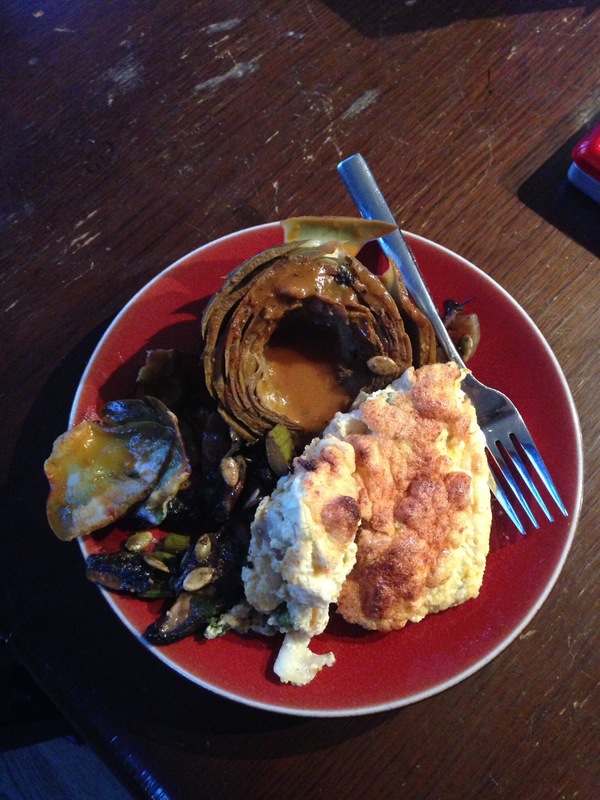 This entry was posted in CSA, garden produce, low carb, main dish, Recipes, vegetarian and tagged asparagus, chard, egg white, souffle, vegetarian. Bookmark the permalink.